A quirky, fast-paced urban fantasy by esteemed author Jane Yolen Aliera Carstairs just doesn’t fit in. She’s always front and center at the fencing studio, but at school she’s invisible. And she’s fine with that . . . until Avery Castle walks into her first period biology class. Avery may seem perfect now, but will he end up becoming her Prince Charming or just a toad? I finished it and was SO ANGRY. Then I learned there was a sequel and my rage was transformed into joyous anticipation. 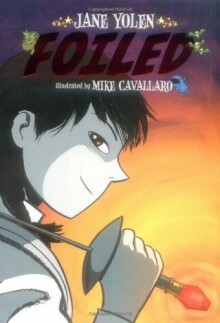 A graphic novel about fencing and magic in New York, written by Jane Yolen.I loved it even more than I thought I would.